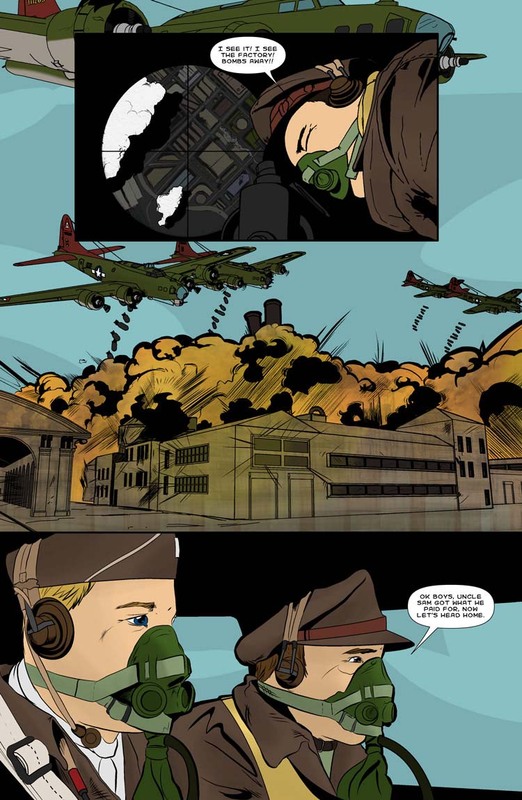 Stashmycomics.com interviews Andy Moore and Eric Weathers, Wichita, Kansas natives and creators of Flying Fortress Comics for the very first segment of Local Creator Spotlight! 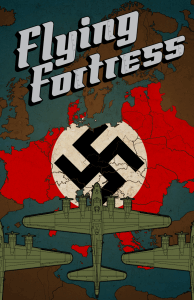 Flying Fortress is a pulp adventure story about a B-17 crew, whose mission to bomb Hitler’s Eagles Nest goes awry when they crash land in the Black Forest of Germany and find zombies! SMC: What influences do you draw from in regards to artists, creators, story ideas, etc.? Andy Moore: I grew up on hand-me-down silver age DC comics: Batman, Superman and the Flash. For our generation, the influence from the Saturday morning cartoons of the 80s to mid 90s was really strong- Superfriends, Teenage Mutant Ninja Turtles, Batman and X-Men! Even as animated shows, they managed to reference lots of classic work, and spark the creativity in me as an artist. Eric and I used to frequent a little comic book booth at the ‘Old Town Underground’ shops in Wichita- and they had the entire set of Will Eisner’s The Spirit reprints- it was a weekly tradition, and for me those comics unlocked a love for pushing the edges of graphic storytelling. Eventually, I got completely hooked on art deco and ‘animated style’ via Bruce Timm from ‘Batman: The Animated Series’ and ‘The Rocketeer’ by Dave Stevens. I also read every single comic collection and comic art history book in the downtown public library. If you lived in Wichita in 1997-2000 you probably saw my black 1948 Plymouth downtown at the library. It’s amazing to think that this was the Jurassic period for the internet- and most of my early influences were found from books and TV. Pretty wild compared to the ubiquity of the internet now! Eric Weathers: For me, it started in the early nineties. My first comic book was X-Men #1 and I became infatuated with Jim Lee’s artwork from day one. He was the most influential artist in my life up until these past 5 years or so. In fact, I would only buy comics if he drew them, or if it was X-Men. It was in and after college when I really started to branch out. I started to follow more artists like David Finch, Kenneth Rocafort, Leinil Francis Yu to name a few. But most recently I’ve been really influenced by Tony Moore, there’s just something about that loose gritty style that makes me want to draw more. SMC: Where did the both of you develop your talents? AM: Mainly from practicing in real life! I have been drawing since I could pick up a crayon, and for the longest time dreamed of being a professional newspaper cartoonist. I took art classes in high school, and earned my degree at Wichita State University in Communication and Graphic Design. Since 1997, I’ve drawn my comic strip “Don’t Panic!” and that allowed me to work on my professional cartoonist style, deadline accuracy and writing skills. Doing professional art and design opened the door to publishing our indie comic books, and we are always trying to earn more as we adventure with the comics. EW: Well, my mom tells me that I’ve drawn (or scribbled) since I was 8 months old, so I guess it all started there, haha. But really I’ve drawn my entire life whether it was doodling during class or copying pictures out of my comics, I’ve always had a pencil in my hand. When I was 16, I decided that I was going to be a comic book artist. I think that was the firs time I realized that there were real people behind these things, making it happen. I never really thought of it beforehand. So during a day of standardized testing at my school I just started making up characters. I still have all of those drawings locked away in my files downstairs. My parents were very supportive. I had my own art studio when I was 16 years old. My parents bought me a drafting table and chair, lighting, and a computer. I was set! I would spend hours pouring over how-to books, and internet articles about how to draw. Back then, it was hard finding a lot of stuff online, you really had to dig for it. However, DC artist Scott McDaniel had a great section on his website (and still does) with all sorts of info that I dived head first into back in the day. Needless to say, there were a lot of “how to draw comics” searches in my browser history. AM: Growing up in the ‘Air Capital’ absolutely was a creative energy for ‘Flying Fortress.’ My grandfather Dale Moore was a young B-17 pilot still training stateside when WWII ended, making that an almost mythical family history for me. Visits to airshows at McConnell Air Force Base, flyovers by any number of classic and amazing aircraft at any time, and the historical richness of Wichita really seeded the ideas for ‘Flying Fortress’ early in our little brains. EW: To answer the first part of your question, yes, we were very intentional in setting it during WWII and making it about these pilots and crew. The Air War is something you don’t see a lot of, so it’s fun to play in that universe. And being set in this real world, I think, helps make the more supernatural aspects of the story have more grounding. For me it’s a bit different. My grandparents were just children during the war, so I don’t have any family history in that vein. However, I am a big WWII buff. Living in Wichita hasn’t had any obvious influence on me, though seeing the old war birds fly over in the summer is great and there are airshows aplenty. SMC: Are there additional challenges in living in the Mid-West, U.S. and trying to be a successful comic creator? AM: It’s a tough area to be a creative in some ways, but it’s amazing too. The areas we are in aren’t classic spots for comic art or media, so the exposure is more difficult. At the same time, it’s easier to focus on the art and craft and try to do things that are really personal and interesting. Now, with the connectivity of the internet, artists are able to connect with people all over- exposing art to audiences that may have never seen it otherwise, so living in the Mid-West is not nearly as much of a hurdle as it might have been in years past. EW: These days, with the way social media has exploded, I don’t think it really matters where one lives. As long as you have an Internet connection, you really have no excuse, nothing can hold you back. Whether it’s a coast, the Mid-West, the South; it’s all the same internet. SMC: Did you both grow up in Wichita? How did you meet? AM: Yes! ICT! (Go SHOX!) We met at our middle school church youth group. We became fast friends and now refer to ourselves as ‘fake brothers.’ My three year old son calls him “Uncle Eric!” One of the things I remember most about first meeting Eric is when our church had a middle school guys Indiana Jones Marathon. I‘ll bet many best friendships were forged over pizza and Raiders of the Lost Ark, and I hope that continues to the next generations of little dudes. EW: We both grew up in Wichita. Andy actually lived within the city limits while I lived in the ‘burbs. Like he said, we met in our middle school youth group. However, his details have been skewed over time. We actually met in the back of a a church van doing a Christmas scavenger hunt with said youth group. Since then, many Pizzas were had, and will continue to be! SMC: What are either of you reading right now? What do you think of DC’s new launch? EW: I read what I can, when I can. I did pick up Justice League #1 (read: Jim Lee) and I plan to continue with that. It was the first paper comic book I’d purchased for probably 3 years or so. Needless to say, I’m behind. I’ve been reading some Indie stuff recently. I really dig Atomic Robo, great art and great writing. AM: I’m a bad nerd, so I don’t have any monthly books these days. I did, however get WAY in to the recent IDW Rocketeer Adventures comics, and loved every moment like I was nine again! AM: I am a full-time freelance artist and designer- it’s a dream come true and a fun (and hectic!) way to use my design and art skills. EW: Outside of freelance comic book work, I’m a stay-at-home-dad. It’s probably the hardest job I’ve held, and I was in the Infantry. I’ve learned to work really fast and well during his naps. Otherwise, there’s no telling what I can get done. SMC: What goals do you have as comic book creators? AM: I personally would love to see our work get out to more and more people. I remember the high regard I had for my favorite art and movies; If we could be that important or inspiring to another artist or fan with our work, that would be so amazing! And it’s always nice to be able to see that you sold a comic book here and there- and connect with like-minded fans and artists at cons or online. EW: I’ll second that. My personal goal is pretty simple. I just want to get better, everything boils down to that. SMC: Any hints to what you have planned for Flying Fortress? Future projects in mind? AM: In addition to planning the next few years of ‘Flying Fortress’ and inkin in our convention schedules, we’re working on a few ideas simmering over the creative fires… ‘Monsters Vs. Vikings’ a collection of stories showing imagination at play. We are also in progress on a golden-age retro Sci-Fi and children’s book series ‘Tommy Stratosphere. EW: For Flying Fortress: Zombies and Medieval Knights. Some future projects include another WWII story based on the Army, lots of D-Day and after in that story. SMC: I noticed you put out a page per week. How do you keep to this deadline? Any tips for others out there? AM: Communication, planning, and babysitters- (We each have toddlers at home!) We have been trying to build enough work so we don’t have too many crazy deadline nights, but they will always happen, no matter how hard we try. We’re experimenting with a digital-scan-to-print system of page collaboration by using two large format printers, and emailing high resolution scans of in-progress art pages. This allows us to instantly send pages from Kansas to Colorado and back instead of waiting days for the mail to arrive- we’re very hopeful that it will unlock some great collaboration and keep us energized. EW: It’s not terribly hard. We’ve added a lot of digital work flow into the process. I’ll rough everything out in Photoshop with Andy during a live video conference. I’ll then refine those roughs until I’m satisfied. Then I’ll print it out in blue line and pencil it. Scan it back in 1200 DPI and send it over to Andy to Ink. He’ll shoot it back to me, My wife will flat, I’ll color and letter and post. We’ve turned a page around in one day before, so we know that if we ever get behind, it wont hurt us that much. SMC: If you could have any super-power, what would it be? AM: I already have a super-power: I am unnaturally skilled at winning those goofy cheap stuffed animal prizes from coin-operated claw machines. We’re talking a near 50% success rate per game! EW: I’ve always wanted to be Wolverine. Thank you Andy and Eric for taking the time to do this interview! 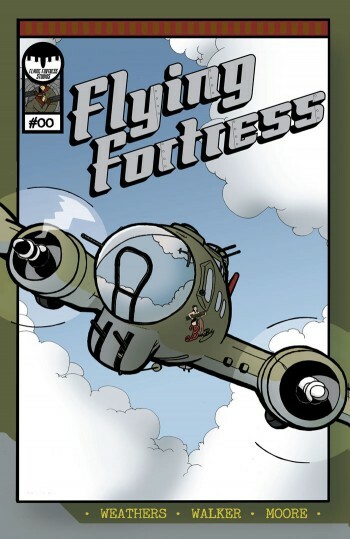 Visit the Flying Fortress website if you are interested in following the weekly adventures and/or purchasing the complete issue #00 in digital or print! Be on the look out for a prize pack giveaway from our friends at Flying Fortress, coming soon! Fantastic interview Chip! I’m definately looking forward to seeing more on Flying Fortress. Keep up the good work guys! Thanks Tim and so do I! I’m a fan of this combination of genres (horror/WWII), and happy to support my home town’s great talent! As an artist myself (musician) I know how much dedication and perseverance is required to get any sort of collaborative project rolling. So kudos to the Flying Fortress duo for making it happen. And hats off to the supportive parents. No doubt that was a great help.